never let it rest - till your good is better - and your better best." 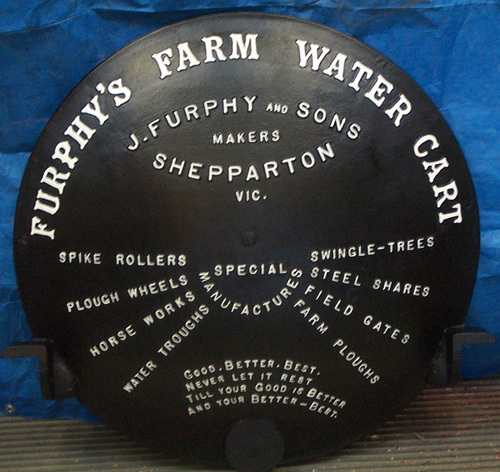 The most distinctive product to carry the Furphy brand would certainly be the water cart. 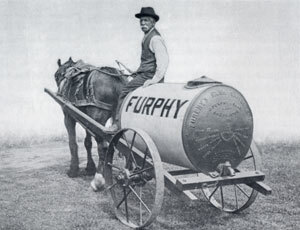 The presence of the cart in military camps in Australia during the First World War led to the name of Furphy becoming an indelible part of our language. The carts were typically placed near the latrine area, the only place in the camp where soldiers were out of the controlling eye of their officers allowing them the freedon to express their thoughts on the latest news that was, at best, unreliable. Known as a "Furphy" Water carts were used extensively in Europe and the Middle East to carry water to the troops. The drivers of the carts were notorious sources of information and gossip for the men as they moved from camp to camp. As could be expected, not all their news was reliable and so it was that the word Furphy rapidly became a synonym for suspect information or rumour. 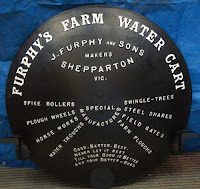 The water cart was in itself a complete invention of John Furphy and was first made in the 1880's. At the time no similar article was used in Australia. Few houses of the time were designed to collect rain water from the roof and hence, water needed to be collected elsewhere and transported for stock and domestic use. The method of carting water was then confined to horse drawn drays or sleds with mounted wooden barrels or casks. At the same time the growing demand for agricultural implements, led to the establishment of a foundry with a furnace to cast components rather than the time consuming task of forging. This became the catalyst for the efficient production of the robust and mobile water carrier known then, and now, as the Furphy Farm Water Cart. John Furphy was an experienced wheelwright and thus employed a similar method of construction for the water tank. It consisted of shrinking an iron band on the end casting to hold and tightly seal the cylinder or body of the tank, just as the iron tyre was fitted to the wooden body of the wagon wheel. 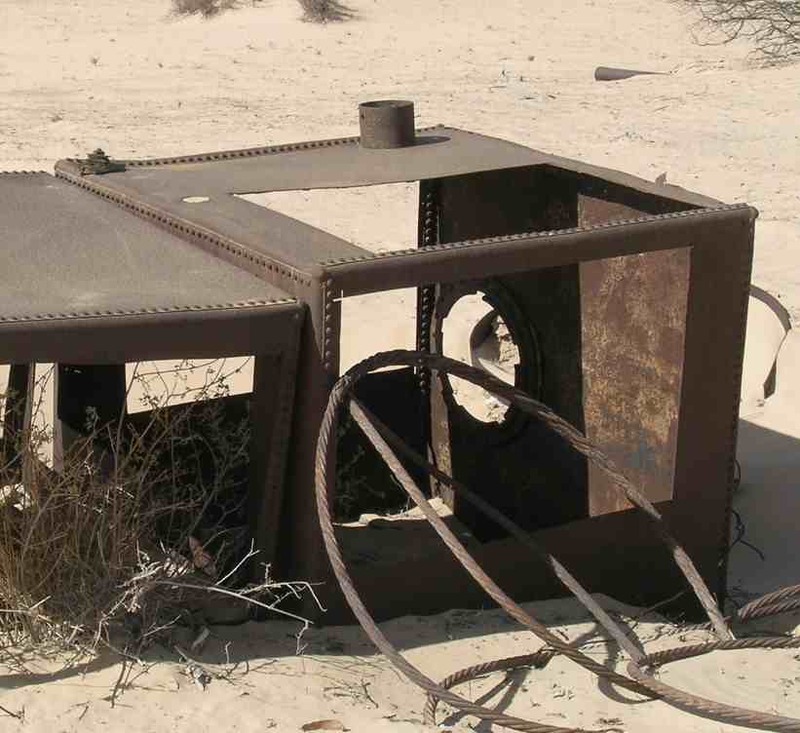 The tanks were made of cast iron ends, 34 inches in diameter with a sheet steel body rolled to form a cylinder. For the first few years the cylinders were made from 1/8 inch black steel . All the sheet steel for the cart barrels was imported from England and Europe. Galvanized sheets were imported when they became available and when John Lysaght began galvanizing in Australia the body sheets were obtained from Melbourne. The first carts were available in 180 and 250 gallon capacities. The 180 gallon unit proved most popular because when filled, it weighed about a ton and was a fair load for a good horse. The tank was carefully balanced over the axle to distribute the weight for the horse whether the tank was empty or full. The cart frame was made from wood and was fitted with 30 inch cast wheels. Rubber tyred wheels and a steel chassis were introduced in 1945, greatly improving the mobility of the cart. The first carts found a ready market in Victoria and the Riverina and eventually found their way into all states. The first end castings were plain, followed by the first to have an inscription reading "Furphy" at the top end of the plate. Shortly after this was changed to read "J. Furphy, maker, Shepparton". The value of advertising was recognised and raised lettering listing the products of John Furphy was added. In 1898, John added a short rhyme with a strong message. It read "Good, better, best - never let it rest - till your good is better - and your better best." John's son, William added a Pitman's shorthand inscription in 1920, which translated tells the reader that "Water is the gift of God, but beer is a concoction of the devil, don't drink beer." In 1942 this was changed slightly to read "Water is the gift of God, but beer and whisky are concoctions of the devil, come and have a drink of water" which has since become the more popular, recited version. Also in 1942, William added a modified version of the saying attributed to W M Hughes, the prime minister of Australia, together with an illustration of a stork holding a baby in traditional fashion. The statement, also in shorthand, read "Produce and populate or perish." Whilst these messages are some of the more notable there were numerous variations to the words cast on the ends produced over the years. The tank itself remained fundamentally the same for the duration of its life. 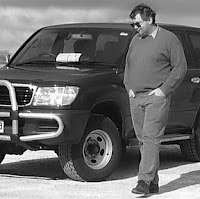 However, ongoing developments regarding the design of the "utility" arrangement and the increased availability of quality hardware and accessories resulted in the number of models over its history. Production of the cast iron ends and other components ceased in 1983. It was then that an all new fabricated and hot dip galvanized tank was developed and continues to be in strong demand today. It has all the features of the original tank including size, profile and durability. However, the replacement of cast iron components with galvanized mild steel make the tank much lighter and more economical to produce. Today, the tradition continues, when during the dry seasons, many old units are brought in for reconditioning. This simply involves the fitting of a new galvanized cylinder to the original cast ends using the same methods to those employed over 100 years ago.